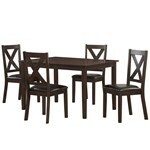 Whether it's for a quick weeknight supper or a special celebration, you'll love gathering around this dining set. Made of handsome materials and with transitional styling, it works well in a variety of kitchens, dining rooms and eating areas. The table, with grooved plank top and tapered legs, is finished in a dark brown that shows off the wood grain. The "X"-back chairs have durable faux leather cushions in black. X back chair with durable, black polyurethane seat cushion.